It’s the most wonderful time of the year and this Festive Season, Sandton City is proud to present another exciting world first, taking patrons on a whimsical theatrical adventure with The Nutcracker’s Winter Circus. Mysterious and magical, with a menagerie of fun and fantastical creatures, The Nutcracker’s Winter Circus is a fairy-tale fit for the whole family, set in a spectacular circus tent in the Centre Court. Enchanting children and adults alike with an ensemble of acclaimed artists in an original theatrical circus; this pioneer production is rooted in vintage European history and set just outside the Black Forest in Southwest Germany, known for its dense, evergreen forests and picturesque villages. Featuring a rich tapestry of magic and interactive illusion, this is the first time that The Nutcracker has been translated into a theatrical circus, and exclusive to Sandton City, will capture the spirit of Christmas in the city. Celebrated for his originality and cutting-edge creativity, The Nutcracker’s Winter Circus is the brainchild of South African Director and Designer Andrew Botha, who has conceptualised everything from the costumes to the colours, fabricating every element from scratch. From the whimsical wonderland created by a Scenic Artist to the special effects costumes crafted by the original Opera House Costumery, the sumptuous visual feast features bespoke fabric designed and created especially for this production. Weird and wonderful, The Nutcracker’s Winter Circus pairs the artistry of storytelling with impressive physical theatre, aerobatics and a handful of ballet classics performed by coveted South African soloists to a musical suite written by Film and Television composer Nikki Saks, based on Tchaikovsky’s original score. Both quirky and classical, the circus is set in an unusual rotunda, but will feature some recognisable highlights such as The Nutcracker Pas De Deux, danced by the Sugar Plum Fairy and Prince Coqueluche. Choreographed by acclaimed Choreographer and Creative David Gouldie, with his extensive experience across the South African theatrical landscape, he brings 38 characters to life through the magic and mastery of movement. From acrobatics to Arabesque, the ensemble is one that will both excite and inspire local and international audiences. The role of the ringmaster Pytor will be played by award-winning physical performer Craig Morris with Lead Female Dancer Rachel Abrahams, who has performed with various companies as a soloist in Cinderella, Coppélia and Giselle the Ballet and Lead Male Dancer Casey Swales, who has performed with various companies as a soloist, including the title role in “The Nutcracker.” They will be supported by an unparalleled ensemble including Grace Stapelberg, Hardy Keeve, Letsedi Motladi, Lloyd van Straten and Bafikile Sedibe. 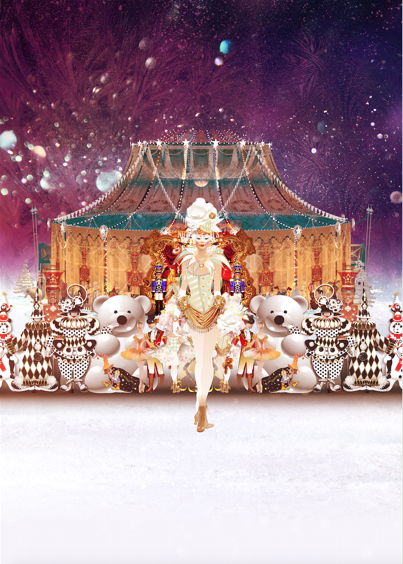 Skilfully produced by Lyall Ramsden, The Nutcracker’s Winter Circus is set to enchant and excite audiences at Sandton City’s Centre Courtfrom the 12th of December to the 6th of January 2019 with four performances per day, with no performances on Christmas Day, Boxing Day and New Year’s Day. Tickets are available from Ticketprosfrom the 26 November 2018 for R15 and at the door for R20, with all proceeds going to charity. Merchandise will also be available to purchase, so that the magic of The Nutcracker’s Winter Circus lives on long after the final curtain for the Festive Season. Sandton City is passionate about Christmas with a good cause, and in addition to this Spectacular, why not get your gifts wrapped in aid of our furry friends at the Sandton SPCA from the 8th to the 24th ofDecember? Giving more than just gifts this festive season, Sandton City will be donating festive wrapping and ribbon to volunteers that will package your gifts perfectly for a donation; with all proceeds going to the Sandton SPCA, who work tirelessly to save and find homes for thousands of animals every year. Making a difference and making memories to last a lifetime, nothing makes Christmas more magical than a picture with Santa Claus! Families will be able to spot Santa Claus and his sleigh in the Centre Court from 9am to 9pm, from the 8th to the 24th of December, and capture their special moments together, regardless of whether they’ve been naughty or nice. The City is a flurry of festivity, and with enchanting activities for the whole family, woven with wonderment, spectacular skill and charm, you’ll want to Come to the City to see the Spectacular and Santa Claus more than once. Sandton City trading hours are from 09h00 to 21h00 until 24 December 2018 excluding Sundays and public holidays of which the trading hours are 09h00 – 18h00.